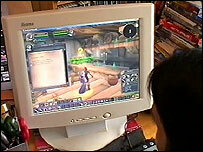 As online gaming becomes increasingly popular, real-world trading of virtual items used in these games has rocketed. Dan Simmons finds out what happens when fantasy gaming meets cold, hard cash. With the spread of broadband connections, multi-player fantasy gaming, in which thousands of gamers can play simultaneously, has taken off. Stunning virtual worlds promise adventure and glory, often for a monthly access fee of around $10 to $15 (£6 to £8). The most popular titles have attracted more than three million subscribers. The social interaction between players often leads gamers to develop tight-knit communities, forming in-game allegiances. It is a formula that has also led to some seriously dedicated playing. Around 20 hours a week is the average. "You've got a lot more human emotions coming in to play, you're getting friends, a social group and you may have a social standing within the group," says Rhianna Pratchett, a gamer and games writer. "It can be very addictive and the hoarding of weapons or getting the best weapon or getting to the next level up or getting the next spell is addictive." One gamer in China even killed a fellow player over a sword used in an online game. But dedicating so much time and effort is not the only route to success. Over the past year the trade in virtual items and currencies used in these online games has been booming, despite it being outlawed by most of the game producers. It is called the secondary market. 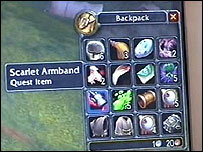 Rather than relying on skill and guile, players can use cash to buy the items they need. Hundreds of dollars can change hands for anything from swords to flying carpets on auction sites such as eBay. And many online companies have started offering direct selling services. This year in Asia the amount of money changing hands for in-game goods is expected to be more than for the games themselves. But there has also been a backlash from many gamers. Matt Royle, who spends four to five hours a day playing World of Warcraft, says richer players are getting an unfair advantage. "People who spend money to buy gold or weapons or even to have their characters levelled up are just plain cheaters, to be honest. "People who play for the real amount of time and for the gaming experience are getting a raw deal because other people come along and just ruin it with their high-level characters or their weapons that they haven't actually earned." And some experts, including lecturer and games consultant Professor Richard Bartle, who helped invent the first online multi-player game, agree. "Most of the players hate this kind of activity, really, really hate it. As far as they're concerned, they're playing a game," he says. "You can't buy a gold medal and then claim you're the world high-jump champion. You have to jump something." Sony Online Entertainment, responsible for EverQuest 2, at first tried to ban the trade in virtual artefacts. But just a few weeks ago it did a u-turn, opening up its own official trading site to US players, called Station Exchange. Chris Kramer, of Sony Online Entertainment, says: "The decision for our company to create Station Exchange was kind of a long road for us. "Over the last five years we've seen the secondary market for sales of virtual goods go from a few guys selling our characters on eBay to about $200m in sales annually. "We can no longer ignore a secondary market that has reached levels as high as that." 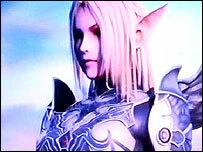 Sony Online says it offers casual gamers who are time-poor a way to keep up with friends who play more often. It also gives new players the option of joining a version of the game that allows real-world trading or one that aims to control it. Some players clearly like the shortcuts that cash offers as well as the chance to make money. Rhianna Pratchett says: "It's always a kick when you find a great weapon in the game anyway, and if you're actually thinking: 'That's great, I can go and sell that on eBay and get myself some DVDs or buy my Mum birthday present' or whatever, I can imagine that can be a lot of fun." Trading in fantasy games can make you serious cash. One player made $4,000 in one month. With real money at stake, these virtual worlds are being used as very real sweatshops. In some countries, groups have been set up simply to collect valuable items and gold, a forbidden practice known as "farming". Others use automated programmes or bots to do the job, but the result is fewer in-game goodies for the genuine players. The gaming companies try to stop them, but it is unclear how much success they are having. Two online sales companies told us it was possible they were being supplied by "professional" players. One, which claimed to do 300 sales a day to World of Warcraft gamers, reassured me that I was unlikely to be banned from the game, or taken to court, if I traded with them. The games developers hold the intellectual rights to everything in the game. So, technically, even if you buy or sell gold or items, they are owned by the game's developer. Blizzard Entertainment, publishers of World of Warcraft, says it monitors what happens in-game as well as on the internet regarding real world trading of items, but it would not reveal how it does this. It says it has taken action against more than 1,000 players. While it does not support independent companies buying and selling its in-game creations, it has not yet decided what action to take about this problem. Blizzard estimates more than 90% of its own World of Warcraft subscribers disapprove of buying virtual items with real cash. Because most real world transactions are completed in-game between characters, some think they will never be stopped. Others believe the gaming hosts are not doing enough to curb it. For those who like to use their cash to get ahead, it enhances their gaming experience. But those seeking a level playing field, where success relies purely on skill and dedication, may soon be left high and dry, dreaming of a fantasy world.